Recently, autonomous driving has made headlines due in part to a tragic accident in Tempe, Arizona, where a pedestrian in Arizona was struck and killed by an Uber sport utility vehicle operating in autonomous mode. The crash in Tempe, Arizona is tragic. It is a high profile case as it was the first reported death caused by a vehicle intended to be fully self-driving. As such, this has the potential to set the autonomous vehicle initiative back with respect to its time horizon for approval. Already a coalition of public interest groups has urged the US Secretary of Transportation, Elaine Chao to toughen voluntary guidelines for autonomous vehicle developers. Also in response to the accident, Uber temporarily suspended autonomous vehicle testing in Arizona, as did Nvidia, whose self-driving platform the vehicle was using. Without diminishing the tragic loss of life in this case, it is also important to put this tragedy in context, as there are an average of 35,000 automotive fatalities a year in the US (12.5 deaths per 100.000 people). While the accident in Arizona has drawn fresh attention to the safety of autonomous systems, as Nvidia noted in its comments as it announced the temporary suspension of its autonomous driving tests, “ultimately autonomous vehicles will be far safer than human drivers, so this important work needs to continue”. Indeed, a report from McKinsey & Co. in 2015 estimated that with widespread adoption of autonomous vehicles and by taking human emotions and errors out of the road, deaths could be reduced by up to 90%, which is the equivalent of 300,000 lives saved each decade in the U.S., and savings of $190 billion each year in healthcare costs associated with accidents. With renewed attention on safety, it is likely to be even more of a focus now than ever before. Nvidia’s CEO Jensen Huang explained at the company’s analyst day that as a result of the accident, he actually believes that investment will rise in self-driving system design, specifically because companies will realize that safety is the one area where they cannot compromise in favour of attempting to lower costs. Decreasing traffic congestion – as driverless vehicles communicate with each other and identify optimal routes, they will be able to better spread demand for scarce road space. Increasing productivity – The average American spends 101 minutes per day driving, which means that over a lifetime an average of 37,935 hours are spend driving a car. Those hours could be spent sleeping, reading, working, or consuming media, increasing overall productivity. Better capital utilization – It has been estimated cars are in use less than 10% of the time. As we move to driverless vehicles, there may be a reduced desire to own a vehicle, resulting in more ridesharing, more optimal use of space (less need for parking spots), and other avenues for auto expenditures. Ever since we swapped in a gas engine powered vehicle in place of a horse, we have had gradual technological evolution in the automotive sector. From 1950-2000, the automotive industry focused on safety with the introduction of seatbelts, antilock brakes and cruise control. The period 2000 to 2010 brought in more advanced safety features such as blind spot detection, forward collision and lane departure warning. 2010-2017 introduced further safety initiatives such as automatic emergency braking (AEB), rear view cameras and lane centering assist. 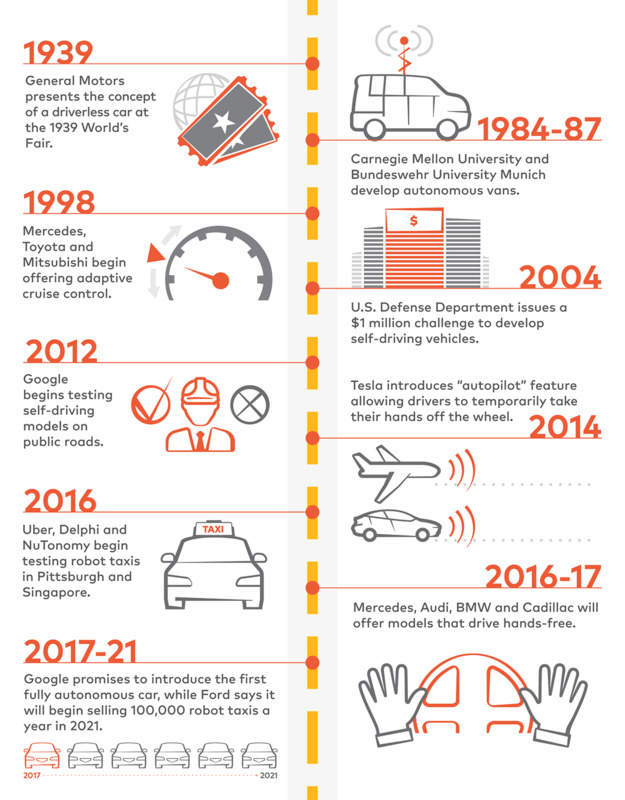 Today, we are in the era of self-parking, adaptive cruise control and next generation of cars expected to put all these advances together to bring us self-driving or autonomous vehicles. In July 2017, the US Congress approved a measure called SELF DRIVE ACT (Safely Ensuring Lives Future Deployment and Research In Vehicle Evolution) that jump started testing of thousands of automated vehicles on public roads and real life conditions all while federal regulators developed safety standards. Prior to that legislation, self-driving vehicles had been tested on side streets and fenced in tracks. This led to a flurry of activity in the self-driving arena. In February 2018, the state of California approved broad new rules allowing the testing of driverless cars that do not require a human operator to sit behind the wheel. Until then, a human had always been present to take over in the event of emergency, a requirement that had pushed companies like Waymo (Google), Uber, Apple, Cruise (General Motors), to test outside their home state in Arizona, Nevada and Michigan which allowed fully driverless vehicles on public roads. Of course, with recent developments, attention on safety will continue to rise, yet autonomous tests are likely to continue. Ford is running a pilot working with food delivery services Domino’s and Postmates in Miami, Florida to investigate how ordinary people respond to receiving their pizza or groceries from a self-driving car. Cruise (GM) recently expanded test locations and settled with Uber on a high-profile lawsuit about theft of self-driving trade secrets. Former Google self-driving chief Chris Urmson founded Aurora and is now working with Volkswagen, Hyundai, and Chinese automaker Byton. Audi and Tesla are expected to release Level 4 cars late this year. What is autonomous driving? In most cars today, the driver has to legally have has his or her hands on the steering wheel at all times. In contrast, for semi-autonomous driving, the driver can legally be allowed to have his hands off the steering wheel for a certain amount of time (10-15 seconds) but is required to take control again if prompted by the vehicle’s system. 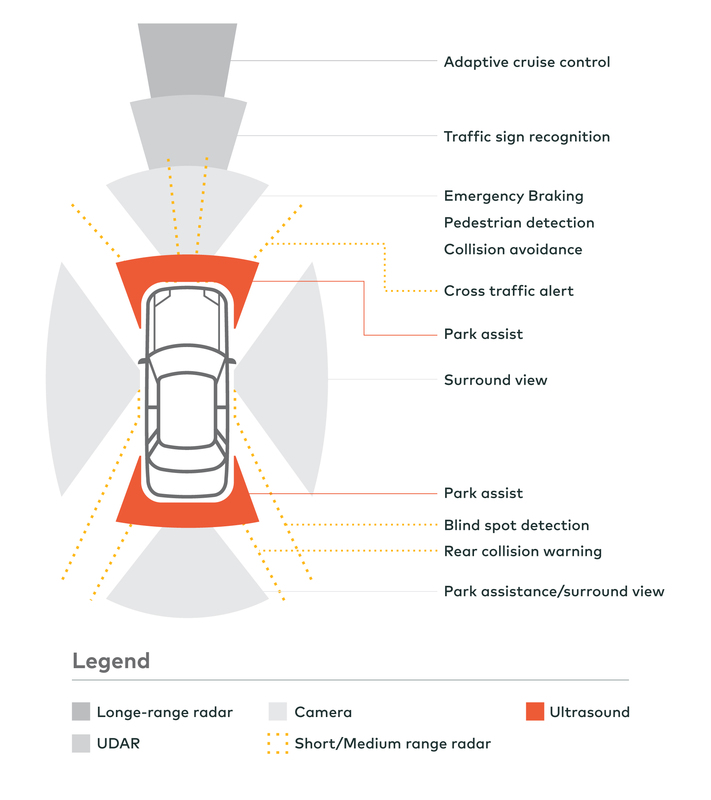 The automotive system therefore needs to know everything about the car’s surroundings at the point when the human driver is transitioning back to full control – e.g., where pedestrians are positioned, structure of the road, and the positions of other cars. This is well beyond the sensing capabilities found in cars today and the move to fully autonomous driving will happen when auto systems are able to demonstrate far fewer mistakes than a human driver. This is when the human driver gives up full control to the vehicle, requiring no one at the driver’s seat. As investors, what interests us are the technologies (and suppliers) that make self-driving cars possible as well as the potential impact to the world around us. Technologies that make autonomous driving possible include vision technologies, LIDAR, mapping, and connectivity. Vision technologies includes driver assistance systems that help prevent imminent accidents by processing visual information. Companies with exposure to growing demand for vision technologies include Autoliv, Mobileye (Intel), and Sony. A related area is LIDAR – Light Detection and Ranging. LIDAR is a surveying method that measures distance to a target by illuminating the target with pulsed laser light and measuring the reflected pulses with a sensor. Beneficiaries from growth in LIDAR technologies include Quanergy and Xilinx (XLNX). Mapping is another critical piece of the autonomous driving puzzle. Detailed high-definition maps are required for autonomous vehicles to get around safely. Companies exposed to this theme include TomTom (TOM2) and Alphabet (GOOGL). And, autonomous cars need to stay connected, so companies like Qualcomm (QCOM) and Skyworks (SWKS) play an important part in the infrastructure of a driverless automobile. Inside the vehicle, Nvidia (NVDA) offers a powerful computing platform (Drive Px) that makes sense of all of the sensor data and figures out the safest path in real time. Each autonomous car will need a “data recorder”, similar to a plane’s “black box”, that will records information about its sensors and systems for at least 30 seconds before a collision, which will necessitate a range of high speed memory and storage from the likes of Micron (MU) and Western Digital (WDC). The other advancement in automotive technology is the electric vehicle (EV). While it makes intuitive sense that autonomous and electric are linked due to reliability (less moving parts), and lower costs (less weight, fuel costs and maintenance), autonomous technology does not have to be electric. In fact, Waymo uses Chrysler Pacifica minivans that are plug-in hybrid electric. Uber tests on hybrid Volvo XC90 SUVs which they want to convert into self-driving taxis. Only Tesla and Cruise (GM) uses their own all-electric P5 and Bolt models as their primary autonomous vehicles. The potential impact of autonomous cars will likely be far beyond that of immediate suppliers. After all the automobile didn’t just replace the carriage, it made possible motels, suburban shopping malls and for a while, drive-in theaters. The autonomous vehicle age may herald more radical changes – as radical as even the Internet age. In a self-driving world, there will likely be less drunk driving fatalities and less speeding tickets which will make municipalities have to consider new sources of revenue. The layout of a car could change - why not have the seats face each other like in a limousine? Suburban sprawl would likely spread (we can happily live further away since we will not be actually driving in rush hour); in-car entertainment will be a premium distinguishing feature as we cue up Netflix or Call of Duty and productivity could spike as we fire up Skype for conference calls and finish that DCF model on Excel365. Security (car-hacking over car-jacking) and connectivity (5G wireless) on autos will be differentiating features. Ride hailing companies like Uber and Lyft will likely provide tiers of service (limo’s on a night out versus SUV on a skiing trip). Auto insurance premiums would likely shrink as driving becomes safer. Over time, shared mobility services would take away from car ownership and maybe even detract from transit services. Consumer data will likely be a battleground – the driver’s location and behavior has monetary value for marketing firms not much unlike individual’s search activity. As such, is it any surprise that Waymo (Google) has invested the most and is the leader in autonomous driving today? In conclusion, driverless cars have the potential to drastically change the world around us. Though it will take years – potentially several decades – before driverless vehicles become ubiquitous, the technologies that will enable that future are being fully developed today. We believe investors would be well served to position themselves to benefit from this long-term secular trend. Commentaries contained herein are provided as a general source of information based on information available as of March 28, 2018 and should not be considered as personal investment advice or an offer or solicitation to buy and/or sell securities. Every effort has been made to ensure accuracy in these commentaries at the time of publication; however, accuracy cannot be guaranteed. Market conditions may change and the manager accepts no responsibility for individual investment decisions arising from the use of or reliance on the information contained herein. Investors are expected to obtain professional investment advice.